Did we miss the punch line or has the boom been and gone already? An interconnected and collaborative work of fiction, poetry, video art, sculpture, installation, illustration, photography, architectural design and fashion. 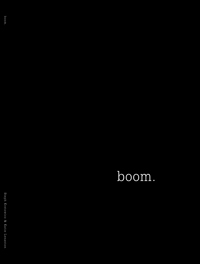 the boom. book binds together new works from 20 of Perth’s most promising young creative practitioners. Please contact us if you would like to stock the boom. publication.